Category: History & Society Series. Tags: 1798 Rebellion, Agha Church, Bagenalstown, Bishop Patrick Foley, Cardinal Patrick Francis Moran, Carlow, Carlow College, Edward O'Toole, Kildare, Leighlin, Leighlin Cathedral, Leighlinbridge, MacMurrough, New Leighlin, Paddy Bergin, Padraig Mac Gamhna, Rathvilly, St. Moling, Thomas A. Cobden, Tullow, United Irishmen. Michael Conry: The Personality of County Carlow: landscape and people. Jenifer Ni Ghradaigh: Agha church: architectural iconography and building ambiguities. Maire B. de Paor: St Moling, contemplative Christianity and the medieval landscape of South Carlow: Biblical style in the poem Gair na Gairbhe. Michael O’Neill: The medieval churches and Old Leighlin Cathedral in County Carlow. Linda Doran: Medieval settlement hierarchy in Carlow and the ‘Carlow Corridor’ 1200-1550. Colum Kenny: New Leighlin: an Anglo-Norman settlement. Margaret Murphy: Tullow – from medieval manor to market town. Emmett O’Byrne: ‘A divided loyalty’: The MacMurroughs, the Irish of Leinster and the Crown of England 1340-1420. Robert MacCarthy: The Church of Ireland in County Carlow, 1549-2000. William Nolan: County Carlow 1641-1660: Geography, land ownership and society. Catherine Ann Power: The origins and development of, c.1671 – 2000. 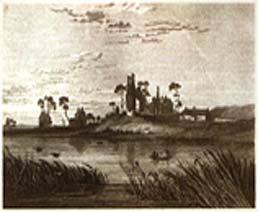 Thomas King: Carlow town and its hinterland in the eighteenth century. Donal McCartney: Parliamentary representation and Electoral Politics in Carlow. John McEvoy: The Carlow College Priest – from Australasia to the Americas. Maura Duggan: United Irishmen, Orangemen and the 1798 rebellion in County Carlow. Pádraig Ó Snodaigh: Ceatharlach i 1798 – nua amharc ar na staraithe. Thomas McDonnell: Thomas A. Cobden, 1794-1842: An architect in County Carlow. Fearghus O Fearghail: Cardinal Patrick Francis Moran of Leighlinbridge, 1830-1911. R. Timothy Campbell and Stephen A. Royle: The country house and its demesne in County Carlow. Jimmy O’Toole: The landed gentry in decline – A County Carlow perspective. Eileen McGregor: Edward O’Toole, 1860-1943: Rathvilly schoolteacher and nationalist. Thomas McGrath: Politics, eductaion and religion in the Age of Revolution: Bishop Patrick Foley of Kildare and Leighlin, 1896-1926. 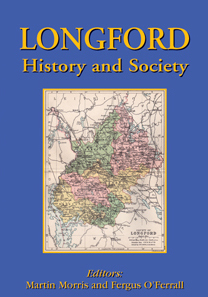 Brian Donnelly: Local Government in County Carlow, 1899-1970. Francis Devine: Pádraig Mac Gamhna, Paddy Bergin and labour in Carlow. Caoimhín Ó Néill: An Ghaeilge i gCeatharloch – Athbheochan agus Athnuachan, 1972-2008. 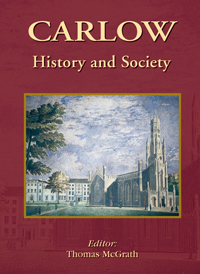 Thomas King and Carmel Flahavan: County Carlow: A select bibliography. Index of names and places.